Note: Maximum working gas represents highest demonstrated levels of storage across all facilities. 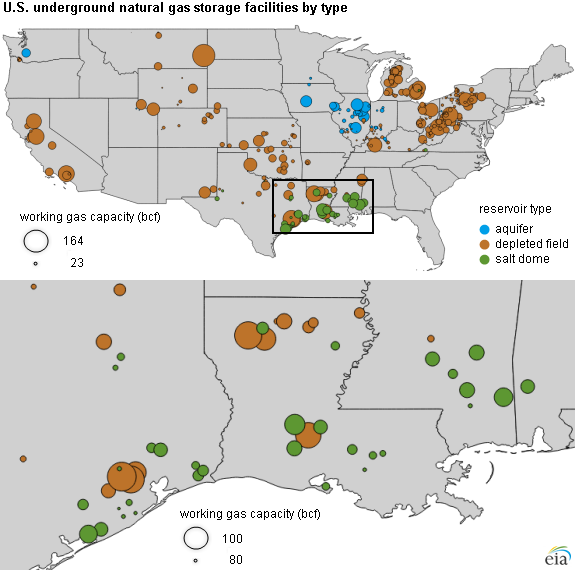 Natural gas stored in salt facilities, principally in the greater Gulf Coast gas-producing region, accounts for only 10% of storage capacity in the Lower 48 states, but it provides 28% of daily deliverability. Salt facilities are underground caverns that operate under high storage pressure and can provide much higher deliverability than other natural gas storage options such as depleted fields or aquifers. Natural gas stored in salt facilities can also be drawn down and refilled, or cycled, as many as a dozen times a year, while gas stored in traditional depleted fields or aquifers generally cycles only once a year. Because cycling is relatively more difficult for these latter facilities, they typically follow a seasonal pattern of injecting gas into storage in the summer and withdrawing it for heating in the winter. With the volume of natural gas used for power generation rising as a component of the gas market, gas more often is called on to meet summer electricity demand for air conditioning as well as for lighting, heating, and industrial uses. Generation fueled by natural gas is also increasingly used to meet sudden, weather-driven demand in any season. The growth in salt facilities has coincided with these changing consumption patterns, as salt facilities can flow gas out of storage and into pipelines headed for utility generators and industrial plants far quicker than from traditional storage. Although salt facilities are more expensive to construct and use on a per-unit-of-capacity basis, their increased flexibility allows operators to more quickly adapt to changing market conditions. Holders of salt-facility gas can take advantage of short-term price movements by quickly selling gas into the market when prices increase. Holders of gas in traditional storage are less likely to take advantage of such movements, either because they cannot withdraw gas as quickly, or they are reluctant to reduce storage levels in August at the expense of having less gas available in January. Note: Maximum working gas represents highest demonstrated levels of storage across all facilities. Bcf is billion cubic feet. 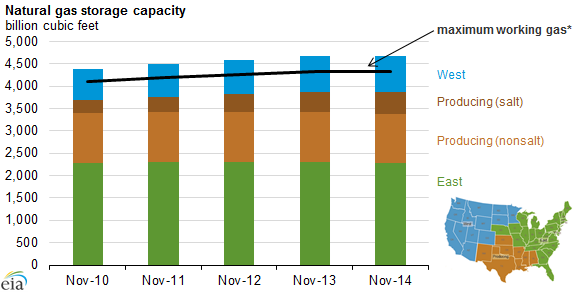 This growth in salt-facility capacity has come while capacity in traditional storage facilities has declined slightly. Salt facilities in the Producing Region have doubled their share of total available working natural gas storage capacity in the Lower 48 states since 2008. In 2014, capacity in salt facilities in the Producing Region grew by 4.4%, resulting in an increase in total national storage capacity, which would have otherwise declined in 2014. New capacity in Producing Region salt facilities has accounted for about half of the new capacity built over the past few years.